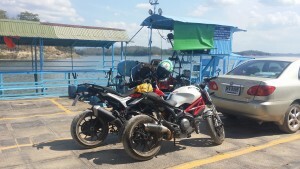 I recently had the opportunity to go for a ride with my mate Matthew from Bangkok, a fellow Aussie Expat, out through Kanchanaburi to take the opportunity to compare the two bikes. We swapped seats throughout the ride and this is what we found. So now we have a real Ducati Hyperstrada 821 vs Ducati Monster 796 shootout. With the Ducati Monster coming in at 87hp and the Ducati Hyperstrada at 100hp, what makes these bikes different and what would be your choice for adventure exploration in Thailand. At the heart of the Ducati Hyperstrada sits an 821 cc Testastretta 11°, 4 valve engine which develops 110 hp at 9,250 rpm and 89 Nm of torque at 7,500 rpm. The Monster has a L-Twin cylinder, 2 valve Desmondromic air cooled engine, developing 87 hp. 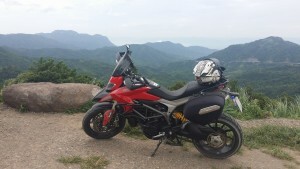 Matthew has done close to 20’000km on his Ducati Monster, fitted an after market slip-on pipe, opened up the airbox with a K&N filter fitted and modified the seat. I recently came back from a 6000km round trip to Shangri-La in China on the Hyperstrada, so for a long haul, this bike definitely delivers with the factory luggage options and the more upright seating position. For me personally, I own the Hyperstrada for many reasons, more power, upright seating position and the factory luggage ability. After riding the Ducati Monster, there is such a noticeable difference straight off the bat with the power delivery, the Hyper feels like it wants to rip your wrists apart at the joints, whereas the Monster is a slower, smoother delivery of it’s power. Past that the riding position on the Ducati Hyperstrada, for me is much more suited to a long distance ride, I feel that on the Monster everything, knees, wrists, back etc would start to hurt at a much earlier point than on the Ducati Hyperstrada. 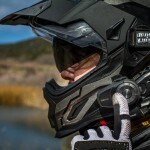 For the full rider review and test ride footage, follow the link below.